To the Right Honourable John Singleton Copley, Lord Lyndhurst, Lord High Chancellor of England, this engraving of Laying Down the Law, is by special desire dedicated to His Lordship by his obedient humble servant Thomas McLean. 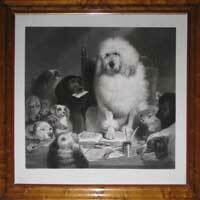 Large-scale etching by Thomas Landseer after the painting by his elder brother, Sir Edwin Landseer; published in London in 1843. 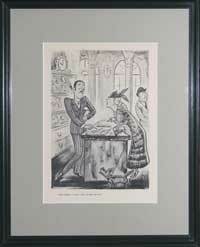 A charming lithograph with original hand colour. 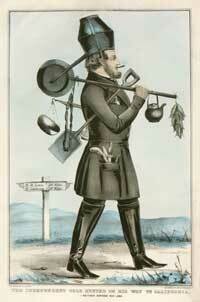 Lithographed by Minories after Fairburn and published in London circa 1840. 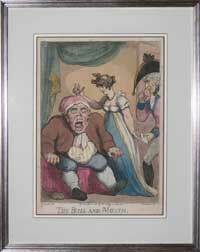 An etching in original hand colour by Thomas Rowlandson; published in London by Tegg in 1811. 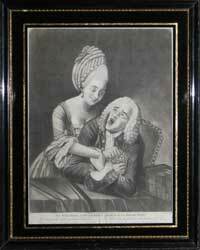 An amusing pair of mezzotint Drolls published by Sayer and Bennett in London in 1777. 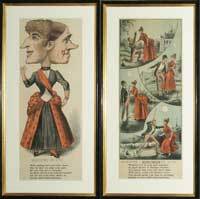 "Mother ventures an opinion" [&] "Father puts his foot down"
"Well, Madam, if I were a man, I'd have that one"
A pair of hand coloured lithographs by Thomas Worth; published by Currier and Ives at 115, Nassau Street, New York in 1878. Cross Readings Near Charing Cross. No 2. 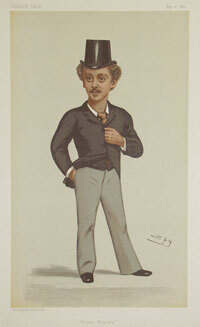 Wood engraving with fine hand colour, published c.1855. 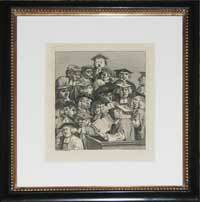 A scarce aquatint and line engraving drawn and engraved by Robert Pollard after Katherine Maria Fanshaw, with aquatinting by J. Wells. Published in London by M. Ryland in 1791. Behold at Brook's step-nay! I'll be bound to say, A figure such as this you'll see there every day-. 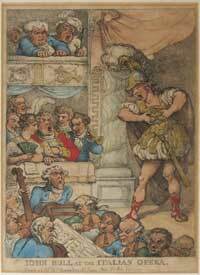 Etching with original hand-colour, 'Drawn by an Amateur' and etched by George Cruikshank, published by Hannah Humphrey, in London June 15th 1815. A cool pipe in Pall Mall! Symptoms of equality. 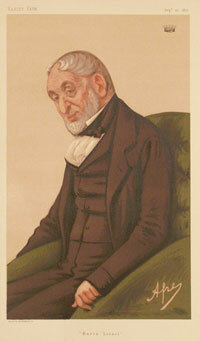 Etching with original colour, published by S.W. Fores April 1st, 1800. 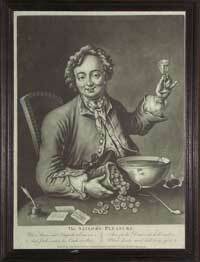 Etching with original hand colour, after the original published by Hannah Humphrey in 1796. 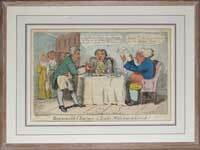 Thomas Rowlandson after George Moutard Woodward. 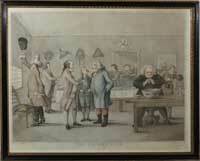 Etching with original hand colour, published in London by Thomas Tegg, December 24th 1808. Etching with original hand colour, published by Thomas Tegg, 1814. 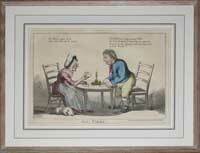 Etching with original hand colour, published by Thomas Tegg, c1811. 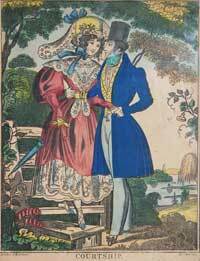 Etching with original hand colour, published by Thomas Tegg, c.1810. Etching with original hand colour, published by William Holland, London, 1805. Isaac Cruikshank after George Moutard Woodward. Etching with original hand colour, published by Thomas Tegg, c.1807. 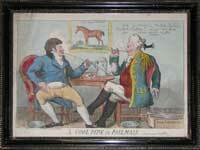 Etching with original hand colour, published by Thomas Tegg, c.1805. 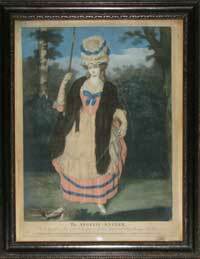 A charming hand coloured mezzotint engraving published by Carington Bowles in London in 1780. 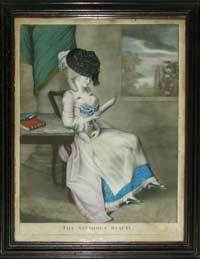 A charming hand coloured mezzotint engraving published by Carington Bowles in London in 1778. 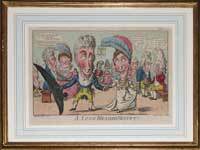 One from a larger series of hand coloured etchings with additional aquatinting, published as part of Thomas Rowlandson's charming and humorous work, The Tour of Dr. Syntax, London 1820. 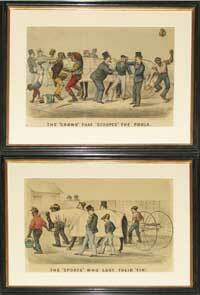 An amusing pair of colour printed lithographs published in London circa 1880. 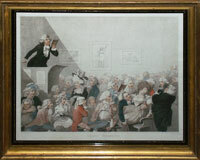 An etching by Isaac Cruikshank after George Woodward in full original hand colour and published by Thomas Tegg in London in 1807. 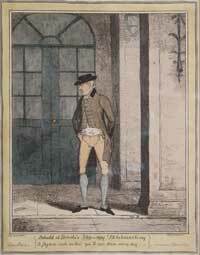 A hand coloured aquatint by George Hunt after the drawing of Theodore Lane, published in London in 1825. 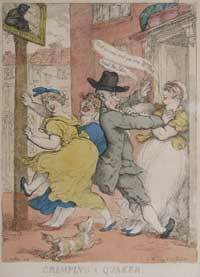 An etching by Thomas Rowlandson in full original hand colour, published in London 1811. 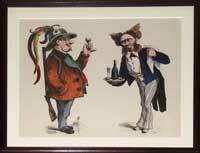 A humorous stipple plate engraving printed in sepia ink with additional hand colour. Drawn by Henry Bunbury, engraved by William Dickinson and published in London in 1788. 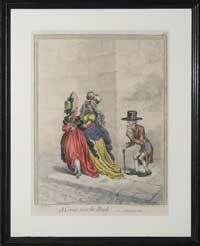 A lithograph in vibrant, original hand colour published by Joseph Scholz in France and Holland between 1850 and 1860. The Independent Gold Hunter on his Way to California. I Neither Borrow or Lend. A charming lithograph in original hand colour by Nathaniel Currier (1813-1888) published in New York between 1849 and 1852. 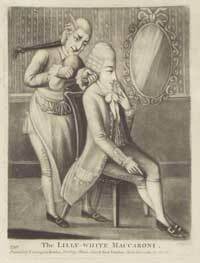 A charming mezzotint droll published in London circa 1772. Two from a larger series (more available) of hand coloured etchings by Isaac Robert Cruikshank (1789-1856); published by Thomas Boys of Ludgate Hill, London, in 1819. An etching in original hand colour, engraved by Robert Dighton and published by Sayer and Bennett in Cheapside, London in 1781. A hand coloured aquatint drawn by an anonymous naval officer and published by Humphrey at his famous print-publishing business on St. James's Street in 1821. 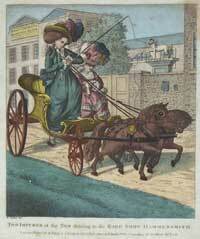 A hand coloured etching published by Thomas McLean in London in 1830. A delightful pair of Georgian drolls depicting society beauties swooning for their lovers' embrace. 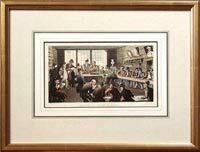 These prints are executed in mezzotint and heavily coloured with watercolour and gouache as was typical of this form of engraving. They were published by Sayer and Bennett in Fleet Street, London in 1784 and 1780 respectively. The Sailor's Pleasure. / When Storms and Tempests all are o'er, / And Jack receives his Cash on shore, / Then for his Doxies all he'll send, / What's dearly earn'd he'll freely spend. 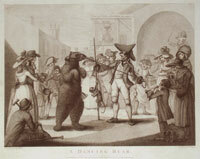 A charming mezzotint droll published in London by Carrington Bowles circa 1790. 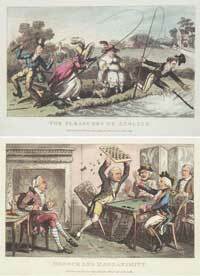 A pair of copper plate etchings published by J. Mortimer in London in 1775 and 1776. One from a large series of chromolithographed plates published in issues of Vanity Fair during the latter half of the nineteenth century. This plate was issued in 1877. Chromolithographic posters by C. Burckardt, published in Weissenburg in the southern region of Alsace, circa 1880. A pair of colour printed stipple plate engravings by Charles Knight after the paintings by R. Boyne, published in London in 1791. Each 22 x 18". Framed. 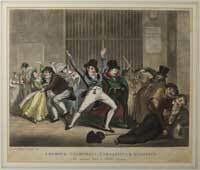 One of a series of hand coloured etchings with aquatint, published in The Tour of Dr. Syntax, London 1820. 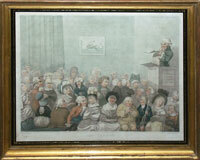 Copperplate etching with original hand colour by Rowlandson after Woodward. Plate size 13 x 9 inches. 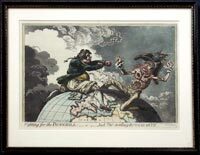 Copper plate engravings with later hand colour published in Bohn’s Complete Works of James Gillray in London in 1849. Exhibition of Water Coloured Drawings, Old Bond Street. 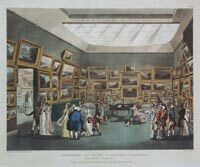 An aquatint in fine original colour, etched by Stadler after Thomas Rowlandson & Charles Augustus Pugin, published by Ackermann, London 1808. One of the series "Ackermann's Microcosrm of London", many others available. Lfe size lithographed portraits by C. Burckardt and others, published in Weissenburg in the southern region of Alsace, circa 1880.